This Personalized KidKraft Sling Bookshelf makes story time a lot more fun by getting children excited about reading! Designed in vivid primary colors, the soft canvas shelves display books by front or back cover instead of the spine to keep books from being damaged. 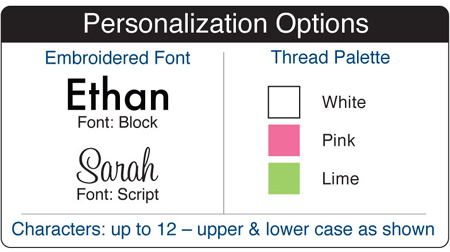 Best of all, you can personalize the bottom sling with up to 12 characters of embroidery in your choice of color and font! Holding books of almost any size, this sling bookshelf is the perfect gift for the young readers in your life. Smart and sturdy constructed, this Personalized Kids Bookshelf measures 24" x 12" x 28" and is perfect for children ages 4+. Availability: This KidKraft Personalized Bookshelf takes approximately 3-5 business days to leave the warehouse plus transit time when non-personalized. Personalized items ship within 3 weeks plus transit time. Please note: This item ships GROUND ONLY. It does not ship Express, to Alaska, Hawaii, PO Boxes, or APO Addresses. Please note: Personalized items cannot be returned. Please note: This item cannot be returned.